Yesterday I went into the office for a meeting with my boss before our bi-weekly conference call. Turns out it was my last meeting. That's it. Finito. I returned my keys, the company VISA, the gas card, maintenance card... Had to give back the BlackBerry! Noooo! So, no cell phone for me. The branch manager gave me a flash drive so I could get what I wanted off my laptop. My boss didn't look over my shoulder or anything. I could take what I wanted. My last company would never have done that!! I didn't take anything company-related anyway. I took the presentations and modules I'd created and anything I'd collected over the year pertaining to sales, etc. My boss (the regional manager) and the area branch manager (both VERY nice people), drove me home in my, I mean, the company van. We got the car seats and all my other stuff out and that was it. I was home by 2pm. Done. No job. No cell phone. No laptop. No van (I am going to miss that van!). I keep replaying that part in my head. It's weird. It's like a fuzzy movie, and it doesn't seem real. But it is. I said to Jean-Paul this morning, "Man, I REALLY miss the van!!" He said, "I think that's second." "Ya, I guess you're right. The money will be missed more than the van." Wonder what life is going to bring? Can it bring lots of money? 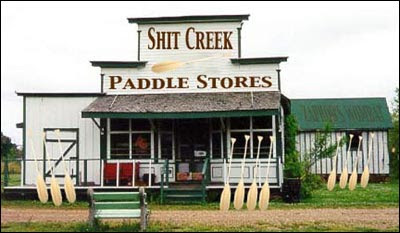 And maybe a paddle. That is a huge bummer. :( How long did you work there for? I was there from July 2008. So, just over a year (in case you don't want to do that difficult math yourself, what with the baby sucking all your smarts and stuff).